This shade is about as deep as Capezio will dare to go for dance shoes — though it is still quite a light FleshTone shade, possibly in the colour range of Misty Copeland. There is one-sided plush elastic attached to the shoe which can be placed on the heel or over the instep. The Freeform does not score points for durability, but scores a few for its caramel colour. It’s lightweight and perfect for rehearsals across a range of dance genres. Prices start from $45USD. These shoes are versatile and they give you a great looking arch. They only lasted me a couple of months though before getting a tear. They were good while they lasted and I needed one size larger. The caramel color suited my medium skin-tone (it would have been perfect it was slightly darker). These were nice, but broke when I wore them on an outdoor stage. They are okay, definitely order a size up, don’t seem to be that durable, but comfortable enough for now. Four stars. I do a range of dance styles and I love how the freeform can be used for all of them. I have both black and the caramel color. The caramel matches me, but its a shame they don’t have more shades. 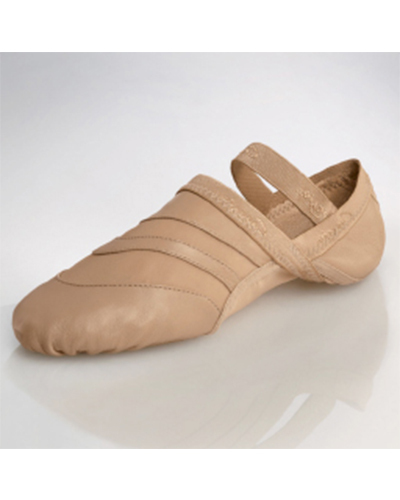 They are very comfortable to dance in – though they definitely do run small. I have had a pair that only lasted a few classes a few years ago, but Ive had better luck since then.